After gorging ourselves on turkey, cranberry sauce and stuffing for the better part of a week, We are turning over a new leaf. A healthy leaf. The “I have a physical on Friday because I turned 50 leaf”. Oh. Dear. No more pumpkin pie for me. At least till Saturday. 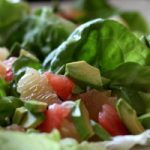 Try Butter Lettuce, Grapefruit and Avocado Salad, I know you’ll love it. It’s perfect for holiday meals coming up. Or if you are cramming for your cholesterol test. Just sayin. Whisk the dressing ingredients together in a small bowl. If you like the dressing to be on the sweeter side add an additional tablespoon or two of honey. Set aside. This can be made in advance and refrigerated until day of serving. Place the cleaned butter lettuce on a tray or on individual salad plates. Fill evenly with grapefruit and avocados. Drizzle with dressing and serve immediately. -If making ahead, prepare the dressing and refrigerate up to three days in advance. Wash the lettuce and store in a Ziploc bag with paper towels to absorb moisture. Cut up the grapefruit, store in a bowl in refrigerator. Drain the grapefruit juice before placing the fruit in lettuce leaves. Slice the avocado and assemble salad just before serving. -I only used about half of the dressing total.